If you enjoy this episode, you can subscribe to get all 51 episodes of the Celtic Christmas Podcast at CelticChristmasPodcast.com. 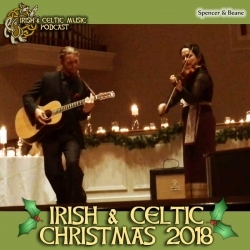 There's a LOT of wonderful Christmas music by Celtic artists that you will enjoy over there. I have another podcast that you might enjoy. Celtfather Music & Travel is a talk podcast about... music and travel. I share thoughts about Celtic music, culture, Celtic Invasion Vacations to Ireland, Scotland, and everywhere I visit. You'll enjoy interviews and rants on topics that affect musicians. It's part Celtic and part Geek, because that's who I am. There are over 200 episodes to choose from that typically range between 5-15 minutes long. In one of the most-recent episodes, I share the latest Celtic Christmas albums I received through this podcast. And other Celtic Christmas music news. And sometimes, I forget to charge you like I did last month. I end up with an over $500 shortfall. I want to thank John T. for raising his pledge on Patreon to help out for this month. I also want to thank all of listeners who put money in my Virtual Tip Jar to help me recoup some of that loss. You are amazing! Thank you!